On moonlit nights in England’s Lake District, women with antlers used to wade in the shallow waters of the lakes. In the Scottish Highlands last century, a woman believed that the wounded swan she had rescued was a "devout lady under a spell." [i] In County Kerry, Ireland, it is said that to eat a hare is to eat your grandmother. These are just a few of the ways in which the boundaries between women and animals continually blur and melt into each other in Celtic tradition. In so many legends and folk-tales, a beautiful faerie woman turns into an animal and then disappears into the Otherworld, or as in the famous story of the selkie, an animal turns into a woman and inhabits our world for a short time, but eventually returns to her own, leaving behind a heartbroken husband. The poem encapsulates the perennial nature of this theme: The “fire in the head” refers to imbas, an old Irish term for the state of inspiration or heightened consciousness. Hazels are the magical trees found at the Well of Wisdom in the heart of the Celtic Otherworld, and the Irish poet’s highest attainment was to gather their nuts which bestowed poetic vision. At one of the streams that flow down from the Well, he catches a trout, the fish that swims in many holy wells throughout the British Isles, an earthly representative of the sacred Salmon of Wisdom. But when he brings this spiritual prize out of the waters of the subconscious mind into the everyday world, it cannot stay for long. It turns into a faery woman and disappears once more beyond the threshold of dream. Because nature and the feminine are inextricably linked, the women and animals of Celtic myth inhabit the secret regions that lie beyond conscious perception because there is no place for them in the shopping malls of the modern mind. They shape-shift back and forth, appearing now as one, now the other, before they vanish into a hidden country. Like Yeats’ glimmering girl, they call to us, hoping we will rediscover their truth and beauty that we have ignored for so long. This archetype is found throughout the ancient world in art and myth as the “Lady of the Beasts,” a goddess who is guardian of the animal kingdom. There was a time when she did not have to disappear, for she was at home among a people who valued the feminine as the bountiful Earth Goddess. In the Neolithic Age, tribes of people lived in Northern Europe by growing crops and domesticating animals. They came from the Mediterranean and Eastern Europe and we have evidence that they were people with a matristic focus who worshipped a goddess of life, death and rebirth. Although there are few traces of her in the British Isles, we can read her names in the oldest text of all – the Book of the Land. She can still be seen there today in the rounded hills that bear her name: Dá Cích Annan, the Breasts of the Goddess Anu in Munster, and the Paps of Jura in the Scottish Hebrides.. As Eriu she became Eire, and all the rivers of Ireland bear her names. One day, Fionn was out hunting with his warband, the Fianna, when a white deer started up from the heather before them. They gave chase, but only Fionn was fast enough to catch up with her. He raised his spear for the kill, when, to his amazement, she lay down in the grass, and his two hunting-dogs began to link her in a friendly way. As he reined in his horse, she rose to her feet and trotted away towards his fortress on the Hill of Allen, the two dogs frolicking around her heels. That same night, Finn awoke to see the fairest woman he had ever seen standing at the foot of his bed. "I am the deer you chased today," she said, "and my name is Sava. Because I would not give my love to the Dark Man of the Sidhe [iii], he put that shape upon me by his sorcery. For three years now I have been hunted in the wild until one of his servants took pity on me and told me that if I could find Finn and the Fianna, the Dark One would have no more power over me and I would be free from enchantment. All day I ran through the forest until I found you. And now I am free." Sava dwelt with Fionn and he made her his wife; and so deep was his love for her that he gave up hunting and fighting to stay by her side all day and night. But there came a day when word was brought to Fionn that the warships of the Norsemen had landed in Dublin Bay and slaughtering all before them. Finn had pledged to protect whoever needed his help in all of Ireland, so he called together his seven battalions and took leave of Sava, holding her close to him and reminding her not to leave the ramparts of the fortress or speak with anyone not of the household. For seven days the Fianna drove off the Norsemen, till at last he knew he could turn south for the Hill of Allen and home. But when he rode eagerly into his fort, a terrible silence greeted him. Sava had gone. The servants told Fionn how one had come in the likeness of Fionn himself, calling out his return to her, and she had run joyfully down to welcome him home. But as soon as she was beyond the safety of the walls, Fionn’s double assumed his real shape as the Dark Man, and struck her with a hazel wand. Where the woman had been, now stood a white deer. Three times the deer sprang up the hill to the wide-open gate – and she almost gained it, but three times the dogs drove her back. The servants seized what weapons were at hand and ran down the hill, but beyond the gate there was nothing to be seen or heard, except the noise of rushing feet and hoof-beats and the baying of dogs that faded into the still air. Seven years Fionn looked for her through every glen and forest in Ireland and at the end of that time, he gave up all hope of finding her again, and went back to his hunting life of old. But one day he came upon a cave in a narrow rocky glen, and there in the mouth of a cave stood a beautiful young boy, naked and with long golden hair. The boy could not talk, and his ways were strange and wild, but there was a look about him of Sava herself, so Fionn brought him home to the Hill of Allen. When he had learned to speak, the boy told how he had been brought up by his mother, a white deer. Fionn knew him for his own son and gave him the name of Oisin: Little Fawn. The Dark Man who enchanted Sava is the negative masculine principle with its powers of separation and destruction. He wins Sava back when Fionn turns from their love to go to war, endangering the protection he afforded her. But Oisin must never have forgotten his mother’s faerie world, because when he was a young man he left the Fianna for love of Niamh of the Golden Hair, a princess of Tír na nÓg, who bore him off to her Otherworld country on the back of her white horse—an animal that often accompanies the Celtic goddess. There is a long Celtic tradition of faerie women who appeared as deer. In Scotland, the Isle of Jura got its name from the Old Norseword for deer, dýr-ey, and was inhabited by seven huge deer-goddesses who lived there with their herds. In the Highlands, the deer-goddess was sometimes seen as an old woman tending her herds of deer in Glen Nevis, and wandering hunters sometimes heard her singing as she milked the does. She was an aspect of the Cailleach, the Old Veiled One, an earth-shaper who had created Scotland’s mountains and isles. As well as appearing in the shape of a deer, she was also seen as a cormorant, eagle or heron. In her human form, she had a cow which gave quantities of white milk, and her band of women rode over the country on wild pigs and wolves conjuring up storms in winter-time. Clearly she was a Mistress of the Wild Things, although in later centuries she was vilified as an evil witch. The story shows how the sacred marriage of masculine and feminine can never come about through a forced union: Through his conquest and dominion of the Earth and her creatures, man has lost his soul; he is split in two and, at the end of the story, is left high and dry (on the land,) irrevocably separated from his feminine half (in the water.) And yet, as in the story of Fionn and Sava, the children provide hope, because they bear some of the qualities of each parent: Legend goes that descendants of the McCodrums have little webs of skin between their fingers and toes. Symbolically, the offspring point to the possibility of union between the opposites. Throughout the world, the soul is symbolized as a bird whose ease of flight is a reminder of the soul’s freedom from the body. Faerie women of Celtic myth often appear as swans as in the Dream of Oengus, a prince of the Irish gods, the Tuatha Dé Danaan. A lovely woman appeared to him in a dream, playing the stringed instrument known as the tiompán. 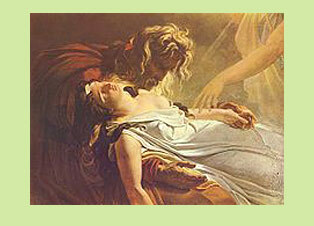 Oengus fell in love with her so deeply that he fell sick with longing. His father, the Great God, Dagda, and mother Boannd, (who gives her name to the River Boyne) searched throughout Ireland for the girl, and at last found her by a lake with “three fifties” of other girls. All the girls were linked two and two by a silver chain, but Oengus' dream girl stood out from them all, for she was taller than the others, and wore a silver necklace and chain of burnished gold. He learned that her name was Cáer Ibormeth, Yew Berry, and that she spent every other year in the shape of a swan. When Oengus returned to the lake next Samhain-tide, he saw “three fifties of white birds with silver chains, and golden hair about their heads.” He called to her to come to him, but she would only agree if he promised to allow her to remain in the shape of a swan. Killing a swan in Ireland was punishable by death, for they were believed to be Otherworld women in the shape of birds, but in the Highlands and Islands of Scotland, the faery nature of swans was Christianized, and they came to be seen as holy women under enchantment. To see a swan was an omen of good fortune. If seven swans, or a multiple of seven, came your way, it was a sure sign of the coming of seven years of peace and plenty. [i] Mackenzie, Donald A. Scottish Folk-lore and Folk Life. Blackie & Son, Ltd.: London and Glasgow: 1935. [ii] Richard Tarnas. The Passion of the Western Mind. New York: Harmony Books, 1991. [iv] A fuller rendition of this story can be found on Celtic Tales of Birds and Beasts by Mara Freeman, Chalice Productions, 1996. [v] Carmichael, Alexander. Carmina Gadelica.Edinburgh: Floris Press, 1992. [vi] Whitmont, Edward.C. Return of the Goddess.New York : Crossroad, 1982.